Thieves vitality is a powerful combination of Clove, Lemon, Cinnamon, Eucalyptus Radiata, and Rosemary essential oils for an aromatic blend that fills any space with a rich, spicy aroma. Use the sweet, spicy flavor of Thieves Vitality as an addition to your daily wellness regimen. 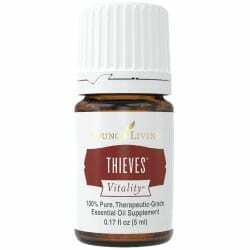 Thieves Vitality is a powerful combination of Clove, Lemon, Cinnamon, Eucalyptus Radiata, and Rosemary essential oils for an aromatic blend that fills any space with a rich, spicy aroma. With Thieves Vitality you’ll have a quick and easy way to balance your busy life and your wellness. With Young Living’s Thieves Vitality essential oil you can support overall wellness and a healthy immune system* with just a few drops. Dilute 1 drop with 4 drops of carrier oil. Thieves Oil Blend was created based on research about four thieves in France, during the 15-century plague, who protected themselves with cloves, rosemary, and other aromatics while robbing plague victims.